Thank you to all my wonderful clients who have voted for me and given me so many excellent accolades. You are the reason I'm in this business, and you make it all so worthwhile. 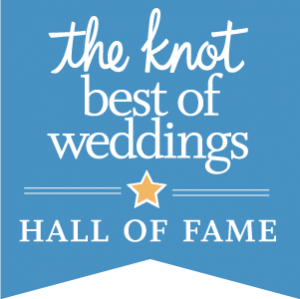 The Knot Hall Best of Weddings Hall of Fame award is an exclusive recognition of wedding vendors who have consistently stood out among their peers, and won no less than 4 individual Best of Weddings awards! From The Knot: We asked our brides to rate and review their wedding vendors. The results? Our annual list of the best wedding venues and top wedding pros. If you are a winning vendor, you'll receive special promotion on TheKnot.com and be eligible for special advertising packages and promotions available exclusively to winners. The WeddingWire Bride's Choice Awards™ recognizes the top five percent of local wedding professionals from the WeddingWire Network that demonstrate excellence in quality, service, responsiveness and professionalism. Unlike other awards in which winners are selected by the organization, the WeddingWire Bride's Choice Awards™ are determined by recent reviews and extensive surveys from over 750,000 WeddingWire newlyweds. From Expertise.com: Our goal is to connect people with the best local experts. We scored wedding planners on more than 25 variables across five categories, and analysed the results to give you a hand-picked list of the best wedding planners in San Diego, CA. Each year (up to 2011), Bridal Insider recognized the best wedding vendors in your area through the annual presentation of the People's Choice Awards. The People's Choice Awards are the highest recognition given to a wedding vendor because they are chosen by a vote of the local brides and grooms that have used the services. 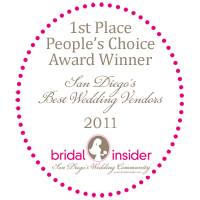 Bridal Insider considers any of their wedding vendors able to be awarded a People's Choice Award. There are no prerequisites of years in business, experience, annual income or number of weddings served. The awards recognize the best businesses for their overall service and customer satisfaction.